Taking Chinese herbal medicine is a way of having treatment twice a day, and therefore gaining significant health results at a much faster pace than a weekly treatment that you might receive at a clinic. With herbal medicine, the health of the whole body is being improved, and a patient normally experiences improvements in sleep, digestion and energy levels, as well as the particular symptom that has brought them in for treatment. Chinese herbs are particularly recommended when health issues are chronic, and possibly affecting overall health. 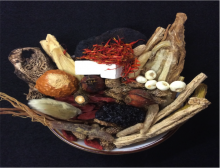 Conditions that respond especially well to Chinese herbal medicine include skin problems, digestive issues, gynaecological complaints, and fertility issues. How effective are Chinese herbs? In China, herbal medicine is an accepted part of healthcare, with many state hospitals offering Chinese herbs alongside Western treatment. The number of Chinese research institutes and training faculties focussing on Chinese herbs attest to their effectiveness. Modern research in the West is increasingly confirming that individual herbs do have the properties that the classical Chinese texts ascribe to them (the work of Tu YouYou, who jointly received the 2015 Nobel Prize for Medicine was based on a Traditional Chinese Medicine). However modern science is a long way from understanding the many complex interactions of active ingredients that make a full traditional formula so effective. How are Chinese herbs different from Western medicines? Chinese herbs are prescribed on an individual basis dependent on the overall health presentation of the patient, rather than based on a particular symptom. As such, two people coming in to see us with the same complaint, for example a headache, might be given very different formulas depending on their age, constitution, digestion, sleep patterns, energy levels, lifestyle, etc. This means that a herbal formula will be beneficial to the patient as a whole, and will be significantly less likely to create side-effects than a Western medication. 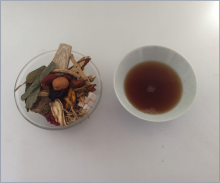 The aim of taking Chinese herbs is to create a change in the body that will allow it return to health by itself. For example, with Western medicine the menstrual cycle can be regulated by taking hormones (the pill), whereas Chinese herbal medicine would give a formula to coax the body into regulating its own hormone production. While the improvement would not be as immediate, it is much more likely to last once the treatment is stopped after a course of Chinese herbs than after taking the pill. So how do I take Chinese Herbal Medicine? Chinese herbs need to be boiled, and the resulting decoction drunk twice a day. The traditional way of preparing them is to soak them for 30min and then to boil them for another 30 min. They can be prepared in advance for 2 to 3 days at a time. This method requires one bag per day, and is recommended for anyone just trying out the herbs for a few days. For anyone looking at longer treatment, we recommend a thermos cook, whereby the herbs are placed in a thermos flask overnight and the decoction is ready to drink in the morning. It is an easier and faster way of preparing herbs. As the herbs are in very hot water for a longer length of time, more active ingredients are extracted, but they do not get broken down as the water doesn’t boil. It significantly reduces the amount of herbs needed and therefore the cost. Some herbs may have quite a strong taste initially, but most people find that they do get used to the taste very quickly, and then find them easy to drink. Chinese herbs are very safe when prescribed correctly by a properly trained practitioner. Over the centuries, doctors have compiled detailed information about the pharmacopeia and placed great emphasis on protecting the patient. At Yi Dao Clinic, your practitioner Conny Cooper holds a BSc in acupuncture and an MSc in Chinese Herbal Medicine from the University of Westminster. This is the highest qualification available in the UK. All our herbs are sourced from Phoenix Medical, a RCHM approved supplier which provides quality assurance and full traceability for all their herbs. We are greatly concerned about the global threat to wild animals and plants. In our pharmacy we strictly use no animal products, nor plants which are listed by the Convention on International Trade in Endangered Species (CITES). All our plants come from sustainable sources.